Our ultrasonic tanks are able to handle cleaning tasks including rubber, aluminum, zinc, stainless steel, copper, brass, ferrous metals and more. We offer a specialized chemical detergent which results in the cleanest solutions on the market. You can trust our ultrasonic tanks to get the job done and we are focused on meeting all of your needs. For unparallel systems and service please visit our website for full readouts or give us a call today to learn more! Ultrasonic tanks are immersion tanks used in ultrasonic cleaning systems that hold cleaning solution as well as the parts that require cleaning. 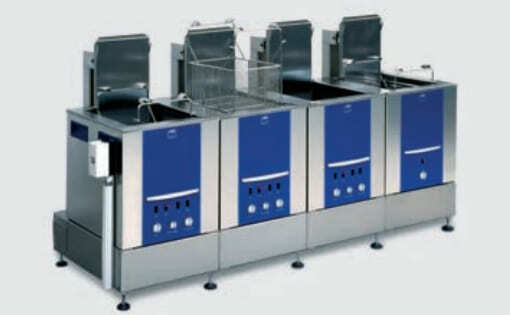 Ultrasonic cleaners use high frequency sound waves to produce bubbles that perform a scrubbing action on a range of items to clean them where other methods cannot. Tanks are a critical component of ultrasonic cleaning equipment and are made out of metal; stainless steel is the most popular choice because its smooth surface has corrosion resistant properties that allow the tank to be cleaned and sanitized quickly and easily. Ultrasonic tanks must be air and water-tight. They are available in many different shapes and sizes depending on the type of objects cleaned in the tanks. When selecting a tank for ultrasonic cleaning, its size is an important factor. For objects like golf clubs, which are long and vertical, the tank used to clean them must match their size and be deep enough to totally emerge the club. Ultrasonic blind cleaners, for example, are often oblong in order to best accommodate the window treatments. The medical, pharmaceutical, automotive, electronics, weapons, marine, sports equipment, beverage and food processing industries use ultrasonic tanks to clean both process machine parts and products that are contaminated during manufacturing. Tanks are one of three main parts of a complete ultrasonic unit; other components include a transducer and a generator. The tanks used in ultrasonic cleaning systems typically have a drain, nozzles and a thermostatic-controlled heating system. The top may be open or have a lid. Small items are placed in a basket which is then submerged in the cleaning solution. Large ultrasonic tanks can fit multiple items at the same time and they may have rotating parts holders, tumbling baskets or oscillating systems to make sure that all parts are evenly and thoroughly cleaned. 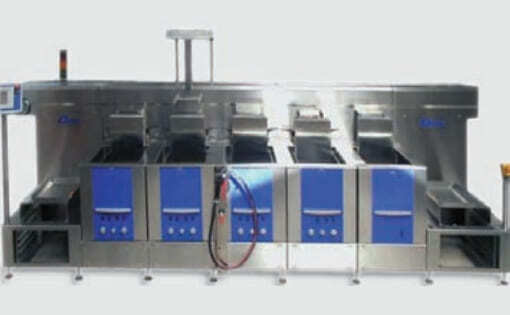 The cleaner’s transducer, the component that introduces sound waves into the cleaning solution, may be mounted directly to the ultrasonic tank or may be manually placed in the tank before operation begins. The ultrasonic cleaning process begins with cavitation, a process which occurs when the transducer introduces ultrasonic sound waves into the tank producing innumerable minute and intense imploding bubbles. These bubbles release both energy and heat to provide a highly efficient method of scrubbing exposed and concealed surfaces of the immersed parts. It is important that metal objects not come in contact with the sides or bottom of the ultrasonic tank because the vibrations caused by the transducer may scratch the item as is the case in ultrasonic jewelry cleaners.